Fascism became a dictatorship in Italy in 1922 and the symbol of "fascio" was placed on the Italian rear plates from 1928. The first of these plates was issued between 1928 and 1932 because the origin code (CR) is after the number and it's just one line, while the others were issued after 1932. 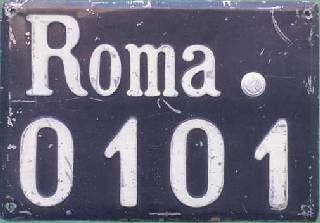 The Roma-0101 plate was used on a diplomatic vehicle between 1936 and 1944 and the difference from other normal plates of that age is the leading zero. (*) Some people told me that IA, IB... plates were used by "Servizio tecnico delle Ferrovie" (technical service of railway), but the error is probably caused by the fact that those plates were issued by "Circoli ferroviari di ispezione" (railway authority for inspection) that had this among other duties (checking private railways). 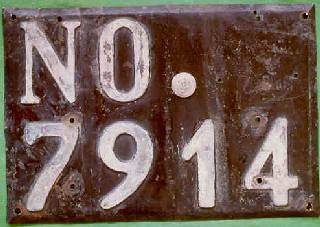 Railway administration has always had normal plates. Many thanks to Guglielmo Evangelista for this correction! Anyway you can also see many other pictures of plates with the fascio on this web site (Italian colonies in Africa and in Rhodes, motorbikes and diplomatic corps). The fascism ended with the short life of the Italian Social Republic and you can find some other pictures of plates of that age in its page. After the end of fascism the new symbol of the Associazione Mutilati e Invalidi di Guerra started being used, even if the old plates were not substituted; anyway many people preferred eliminating the fascio from the plate, removing it or using a black paint. I need to thank Alessandro Libanore very much for the three pictures on the left, Giancarlo Raposo for the list of codes and Roberto Pola for his correction about UNPA!